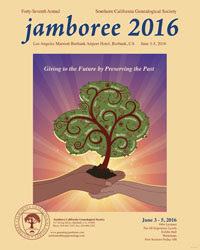 I am attending the Southern California Genealogical Society (SCGS) 2016 Genealogy Jamboree in Burbank, California from June 2 through June 5, 2016, with a number of other geneabloggers. This post will serve as a compendium for blog posts by genealogy bloggers attending the SCGS Genealogy Jamboree and writing about their activities. There are many posts on Facebook and tweets on Twitter using the hashtag #SCGS2016 - check them out. If you have written blog posts about the SCGS 2016 Jamboree, and I haven't seen them or just missed them, please comment on this post and I will add a link to your blog post. Looks like there are fewer geneabloggers at Jamboree this year who are having too much fun to write blog posts. Last updated: 16 June 2016, 1 p.m.
Randy-Here's my blog post for the first 2 days of Jamboree. Oh, those bloggers will catch up with their blog posts from Jamboree...eventually! Thanks for adding my entry, Randy! And I certainly appreciated your class yesterday. Thanks Randy for the mention! My new Jamboree post is up and see what an exciting end to the day I had. Hi Randy. I've posted twice!!! today about Jamboree, http://www.mkrgenealogy.com/searching-for-stories-blog/me-and-dr-jones and http://www.mkrgenealogy.com/searching-for-stories-blog/i-flew-951821-miles-to-meet-a-neighbor. Thanks for catching all of us up with the Jamboree blogs! A final day at Jamboree and a another great day! Thanks Randy for mentioning my blogs and for the photo op with you! Thanks for collecting all the posts together!